Inducible BALT (iBALT) can amplify pulmonary or systemic inflammatory responses to the benefit or detriment of the host. We took advantage of the age-dependent formation of iBALT to interrogate the underlying mechanisms that give rise to this ectopic, tertiary lymphoid organ. In this study, we show that the reduced propensity for weanling as compared with neonatal mice to form iBALT in response to acute LPS exposure is associated with greater regulatory T cell expansion in the mediastinal lymph nodes. Ab- or transgene-mediated depletion of regulatory T cells in weanling mice upregulated the expression of IL-17A and CXCL9 in the lungs, induced a tissue neutrophilia, and increased the frequency of iBALT to that observed in neonatal mice. Remarkably, neutrophil depletion in neonatal mice decreased the expression of the B cell active cytokines, a proliferation-inducing ligand and IL-21, and attenuated LPS-induced iBALT formation. Taken together, our data implicate a role for neutrophils in lymphoid neogenesis. Neutrophilic inflammation is a common feature of many autoimmune diseases in which iBALT are present and pathogenic, and hence the targeting of neutrophils or their byproducts may serve to ameliorate detrimental lymphoid neogenesis in a variety of disease contexts. Inducible BALT (iBALT) is an ectopic tertiary lymphoid organ of the lung that consists of T and B cell areas with germinal centers, and high endothelial venules that allow for lymphocyte entry from the blood. iBALT develop postnatally, are evident in many autoimmune/inflammatory disorders (e.g., rheumatoid arthritis, Sjogren’s disease, chronic obstructive pulmonary disease [COPD]), and may contribute to immunopathology through the production of autoantibodies or allergen-specific Abs (1, 2). In contrast, iBALT can limit immunopathology and can contribute to host defense against respiratory pathogens (3, 4) via the creation of a local niche to facilitate immune cell crosstalk and accelerated T cell priming (5). Thus, understanding the processes that underlie iBALT formation may offer strategies to limit immunopathology or enhance protective immunity (6, 7). Despite the fact that iBALT is not preprogrammed like secondary lymphoid organs (SLO), the incidence of iBALT is greater in early life [a phenomenon observed in multiple species (8, 9)], suggesting that a developmental window may exist. Lymphoid tissue-inducer (LTi) cells, which communicate with stromal cells to orchestrate SLO neogenesis (10), are elevated in early life (11) but are dispensable for iBALT formation (3, 12, 13). Instead, new evidence has implicated innate and adaptive IL-17–producing cells in the formation of iBALT and other ectopic lymphoid tissues (12, 14). Intriguingly, CCR7−/− mice spontaneously develop iBALT in early life, a phenotype that is lost following the adoptive transfer of CCR7+/+ regulatory T (Treg) cells to CCR7−/− mice, suggesting that Treg cells can suppress iBALT formation (15). This is noteworthy because a reciprocal counter-regulatory relationship exists between Treg cells and Th17 cells. Although Treg cells are induced under the control of TGF-β, the coexpression of IL-6 leads to the activation of the transcriptional regulator retinoic acid receptor–related orphan receptor–γt (RORγt), which redirects lineage fate toward IL-17A–, IL-21–, and IL-22–producing T cells (11). In addition, the proinflammatory cytokines IL-1β and IL-23 contribute to the differentiation and expansion of Th17 cells while suppressing the regulatory effects of Treg cells (16–18). Moreover, IL-6 and IL-21 can induce conventional T cells to become refractory to Treg cell suppression (19, 20). However, whether the balance between IL-17–producing cells and Treg cells extends to control ectopic lymphoid formation in the lung remains to be determined, as does the molecular basis by which IL-17A promotes iBALT formation. In this work, we show that the reduced susceptibility of weanling mice to form iBALT is associated with increased Treg cells in the mediastinal lymph node (MLN) following acute LPS exposure. 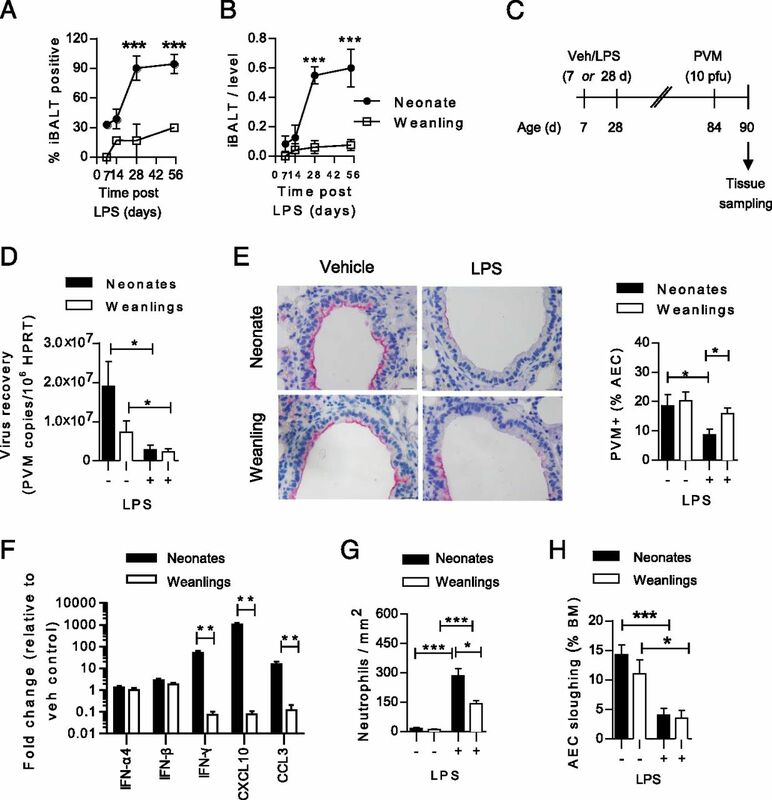 In the absence of Treg cells, LPS treatment led to a greater neutrophilic response in the lung and restored the capacity of weanling mice to form iBALT. Remarkably, neutrophil depletion in neonatal mice decreased the expression of the B cell active cytokines, a proliferation-inducing ligand (APRIL) and IL-21, and attenuated LPS-induced iBALT formation, indicating a role for neutrophils in lymphoid neogenesis. Wild-type BALB/c and C57BL/6 pregnant mice were obtained from Animal Resources Centre (Perth, WA, Australia) and housed in individually ventilated cages at the University of Newcastle or University of Queensland. Foxp3-GFP-DTR (BALB/c background) mice (21) were provided by A. Rudensky (Memorial Sloan-Kettering Cancer Center). All experimental procedures were conducted according to approved guidelines by the Animal Care and Ethics Committees at both universities. LPS (10 μg/g body weight; Sigma-Aldrich, Castle Hill, NSW, Australia) or vehicle (PBS) alone was administered to wild-type neonatal (7-d-old) or weanling (28-d-old) mice via the intranasal route. The LPS exposure was performed twice (i.e., 2 × 5 μg/g body weight) over a 1-h interval to increase the probability of delivery to the airway. Wild-type BALB/c neonates or weanlings were inoculated intranasally with LPS (10 μg/g body weight) or vehicle. At 84 d of age, mice were lightly anesthetized with isofluorane and inoculated with pneumonia virus of mice (PVM) (10 PFU) strain J3666 (22). Mice were euthanized 6 d post-PVM infection. To deplete Treg cells, rat anti-mouse CD25 Ab (100 μg; clone PC61) or rat IgG1 isotype control (BioLegend, San Diego, CA) was administered (i.p. route) to wild-type BALB/c weanling mice at days 26, 27, 30, 33, and 40 of life. Alternatively, male wild-type BALB/c and Foxp3-GFP-DTR (BALB/c background) weanling mice were treated with 600 ng diphtheria toxin (Merck Millipore, Kilsyth, VIC, Australia) at days 27, 28, 29, 30, 33, 36, and 38 of life. For neutrophil depletion, 10 μg anti-Ly6G (clone 1A8; BioLegend) or isotype control Ab was administered (i.p. route) to wild-type BALB/c neonatal mice at days 6, 7, 8, and 9 of life. To block IL-21 signaling, mice were treated with IL-21R-Fc, as previously described (23). The left lung lobes were fixed in 10% neutral buffered formalin (Thermo Fisher Scientific, Scoresby, VIC, Australia) overnight, before being transferred to 70% ethanol. Paraffin-embedded sections were baked at 37°C for 15 min, then sequentially passed through the following solutions: thrice in xylene, twice in absolute ethanol, and once in 70% ethanol for 2–5 min each. After a wash in deionized water, Ag retrieval was performed by boiling the slides in 10 mM citrate buffer (pH 6) in a pressure cooker for 10 min. Sections were blocked by incubating with normal goat serum at room temperature for 30 min, prior to the addition of primary Ab, which was incubated overnight at 4°C. Primary Abs were diluted in 10% FCS in PBS and included the following: anti-B220 (BD Biosciences, North Ryde, NSW, Australia; catalog 553086), anti-CXCL9 (R&D Systems, Minneapolis, MN; catalog AF-492-NA), anti-Foxp3 (eBioscience, San Diego, CA; catalogue 14-5773-82), anti-PVM (provided by U. Buchholz, Laboratory of Infectious Diseases, National Institute of Allergy and Infectious Diseases), anti-APRIL (IMGENEX, San Diego, CA; catalog IMG-5551-1), and anti-Ly6G (BD Biosciences; 551459). The secondary Ab (alkaline phosphatase [AP]-streptavidin, AP-conjugated rabbit anti-goat IgG, AP-conjugated goat anti-rat IgG, or AP-conjugated goat anti-rabbit IgG; Sigma-Aldrich) was incubated at room temperature for 45 min. The slides were washed and incubated for 5–20 min with Fast Red substrate (Sigma-Aldrich; F4523), and then washed in tap water to terminate the reaction. Slides were then flash stained in Mayer hematoxylin (Dako, Kingsgrove, NSW, Australia). iBALTs frequently contained high endothelial venules and organized T and B cell areas (Supplemental Fig. 1A), consistent with BALT. For iBALT quantification, 5-μm–thick paraffin-embedded sections were cut in the dorsoventral plane at 4 or 12 levels (as stated in the legend for Fig. 1B), at 200-μm intervals, and iBALT was defined as an organized aggregate of 30 or more B220+ cells. To calculate iBALT per level, the sum of iBALTs was divided by the number of levels quantified. To quantify viral load, PVM-positive cells were expressed as a percentage of airway epithelial cells (AECs). PVM in the parenchyma was quantified by point-counting and expressed as percent positive. CXCL9 expression in AECs was quantified as per PVM. Gene expression of IFN-α4, IFN-β, IFN-γ, CCL3, TNF-α, IL-6, lymphotoxin (LT)-α, CXCL13, CCL19, CCL21, CCL2, CCL5, CXCL9, CXCL10, CXCL11, IL-17A, IL-21, IL-22, TGF-β, IL-1β, IL-23p19, APRIL, TACI, and BCMA was determined using the SYBR GreenER reagent system (Applied Biosystems, Mulgrave, VIC, Australia). Hypoxanthine-guanine phosphoribosyltransferase was used as an endogenous reference housekeeping gene, and the results were analyzed using the δ δ threshold cycle (Ct) method (2−ΔΔCt). This method was used to calculate the relative fold change of the target genes. The Ct is the point at which fluorescence above the background is detectable. ΔCt was calculated as the difference between the Ct value of specific group of mice/treatment (or target group) and the Ct value of control/vehicle group. ΔΔCt was calculated as the difference between the ΔCt value of target group and the ΔCt value of control/vehicle group. The values derived from the 2−ΔΔCt method show the fold changes of the target gene in treated group relative to those of the control/vehicle group. The 2−ΔΔCt value of control/vehicle samples was normalized to 1. The following quantitative PCR primers were used: HPRT, 5′-AGGCCAGACTTTGTTGGATTTGAA-3′ and 5′-CAACTTGCGCTCATCTTAGGCTTT-3′; IFNα4, 5′-CAGCATCTACAAGACCCACAA-3′ and 5′-GCAGGTCACATCCTAGAGAAC-3′; IFNβ, 5′-AGAGTTACACTGCCTTTGCCATCC-3′ and 5′-CCACGTCAATCTTTCCTCTTGCTT-3′; IFNγ, 5′-TCTTGAAAGACAATCAGGCCATCA-3′ and 5′-GAATCAGCAGCGACTCCTTTTCC-3′; CCL3 (Mip-1α), 5′-CCTCTGTCACCTGCTCAACA-3′ and 5′-GATGAATTGGCGTGGAATC-3′; TNF-α, 5′-GTCTACTGAACTTCGGGGTGATCG-3′ and 5′-AGCCTTGTCCCTTGAAGAGAACCT-3′; IL-6, 5′-AGAAAACAATCTGAAACTTCCAGAGAT-3′ and 5′-GAAGACCAGAGGAAATTTTCAATAGG-3′; LT-α, 5′-ACCAGAAACTGACCTCAACCCTGA-3′ and 5′-CCCGACGTGGCAGTAGAGGTAATA-3′; CXCL13, 5′-TTCTGGAAGCCCATTACACAAA-3′ and 5′-ATTTGGCACGAGGATTCACACA-3′; CCL19, 5′-GATTCCAGTCACTCCCCTGTGA-3′ and 5′-AGCAGTCTTCCGCATCATTAGC-3′; CCL21, 5′-TTGTCCGAGGCTATAGGAAGCA-3′ and 5′-CAGACTTAGAGGTTCCCCGGTT-3′; CCL2, 5′-CCAACTCTCACTGAAGCCAGCTCT-3′ and 5′-TCAGCACAGACCTCTCTCTTGAGC-3′; CCL5, 5′-CTCCAATCTTGCAGTCGTGTTTGT-3′ and 5′-ACAGGGAAGCGTATACAGGGTCAG-3′; CXCL9, 5′-TGTTCTTTTCCTCTTGGGCATCAT-3′ and 5′-CCCCTCTTTTGCTTTTTCTTTTGG-3′; CXCL10, 5′-GGATGGCTGTCCTAGCTCG-3′ and 5′-ATAACCCCTTGGGAAGATGG-3′; CXCL11, 5′-TGAACAGGAAGGTCACAGCCATAG-3′ and 5′-CGCCCCTGTTTGAACATAAGGAAG-3′; IL-17A, 5′-CAAACATGAGTCCAGGGAGAGCTT-3′ and 5′-ACTGAGCTTCCCAGATCACAGAGG-3′; IL-21, 5′-GCCATCAAACCCTGGAAACAATAA-3′ and 5′-CTCCTCAGTCCTCGGGAATCTTCT-3′; IL-22, 5′-TACATCGTCAACCGCACCTTTATG-3′ and 5′-TCTTCTGGATGTTCTGGTCGTCAC_-3′; TGF-β1, 5′-CCCGAAGCGGACTACTATGCTAAA-3′ and 5′-GGTAACGCCAGGAATTGTTGCTAT-3′; IL-1β, 5′-GGATGAGGACATGAGCACCTTCTT-3′ and 5′-TGTCGTTGCTTGGTTCTCCTTGTA-3′; IL-23p19, 5′-CTGGCTGTGCCTAGGAGTAGCAGT-3′ and 5′-TCCCCTTTGAAGATGTCAGAGTCA-3′; APRIL, 5′-CCTCACTTCTGAGACCACAGC-3′ and 5′-GAACAACAGTCAAGGCAAAGC-3′; TACI, 5′-ACGTGGGTCACAAGCAAACTCTC-3′ and 5′-AAGCAGAAGCTACACGTTTCCACA-3′; BCMA, 5′-TCCTCTCTTTGGCACTTTTCACAA-3′ and CCTGATCCTAGTCAGCTCGGTGTC-3′; PVM Src homology, 5′-GCCTGCATCAACACAGTGTGT-3′ and 5′-GCCTGATGTGGCAGTGCTT-3′. The concentration of IL-6, IL-21, TNF-α (eBioscience), IL-1β, IL-17A, and IL-22 (BioLegend) in lung homogenates was measured by ELISA, according to the manufacturer’s instructions. Cytokine concentrations were normalized to the total protein concentration (determined using the bicinchoninic acid protein assay kit [Thermo Fisher Scientific]) of each sample. Single-cell suspensions were obtained from the lungs and draining lymph nodes of mice. Mouse Fc receptors were blocked with purified rat anti-mouse CD16/CD32 (clone 2.4G2) (1 μg per 1 × 106 cells). Surface staining was performed by incubating 1 × 106 cells with anti-CD4 (clone GK1.5; BD Biosciences) and anti-CD25 (clone 7D4; eBioscience) Abs. The cells were then washed, fixed in 10% neutral buffered formalin (Sigma-Aldrich), washed again, and incubated with 0.1% saponin in PBS (supplemented with 2% FCS) on ice. Permeabilized cells were stained with anti-Foxp3 (clone FJK-16s; eBioscience) and washed, and the cell pellets were resuspended in 0.5% formaldehyde in PBS. Neutrophils and myeloid-derived suppressor cells were phenotyped using a combination of anti-CD11b (BD Biosciences), anti-Ly6G (clone 1A8; BD Biosciences), and anti-Ly6C (BioLegend). Data acquisition and analysis were performed on a FACSCanto flow cytometer (BD Biosciences) using BD FACSDiva software. Data were analyzed using Prism 6 software (GraphPad Software, La Jolla, CA) by either Student t test (column analyses) or one- or two-way ANOVA with Bonferroni posttest (group analyses). The p values <0.05 were considered significant. Multiple instillations of TLR ligands such as LPS or heat-killed bacteria over a period of days or weeks have been shown to induce the formation of iBALT (12, 24, 25). To determine whether LPS on day 0 alone was sufficient to induce iBALT in BALB/c mice, 7-d-old (designated neonates) BALB/c mice were intranasally inoculated with various doses of LPS. The percentage of mice that developed an iBALT (Supplemental Fig. 1B) and the number of iBALT/level (Supplemental Fig. 1C) increased with the dose of LPS. Using our acute LPS exposure model, we next determined whether neonates were more susceptible than weanling (28-d-old) mice to LPS (10 μg/g)-induced iBALT development. Whereas >90% of neonatal mice contained an iBALT at 28 d post-LPS inoculation (dpi), fewer than 20% of weanling mice had developed an iBALT area (Fig. 1A, 1B). iBALT formation is age dependent and protects against acute Pneumovirus infection. Wild-type BALB/c neonates or weanlings were exposed to LPS (10 μg/g) and killed at the indicated time points postexposure. The frequency of mice that developed iBALT (A) and number of iBALT per level (at 4 levels) (B) were assessed as per Materials and Methods. (C) Study design for acute PVM infection. (D) Viral load in the lungs was determined by quantitative PCR. (E) Representative photographs of PVM immunoreactivity (red) in the airway epithelium, and quantification as a percentage of AEC. (F) mRNA expression in the lungs of LPS-treated, PVM-infected mice 6 d postinfection. The expression of each gene in age-matched vehicle controls was normalized to 1. (G) Number of pulmonary neutrophils in PVM-infected mice as measured by immunohistochemistry. (H) AEC sloughing in PVM-infected mice; percentage of the circumference of epithelial basement membrane (BM). Data are mean ± SEM (n = 5–10 mice per group) of one representative experiment, performed >2 times, except (A) and (B), which represent mean ± SEM of multiple independent experiments. *p < 0.05, **p < 0.01, ***p < 0.001 analyzed by two-way ANOVA with Bonferroni posttest or Student t test, as appropriate. HPRT, hypoxanthine-guanine phosphoribosyltransferase. Taking advantage of the age-dependent formation of iBALT formation to acute LPS exposure, we examined whether iBALT would protect against a primary infection with the rodent-specific Pneumovirus, PVM. To limit the potential for any spillover adjuvanticity from the LPS exposure, mice were inoculated with PVM at 12 wk of age (Fig. 1C). Virus burden as assessed by quantitative PCR for the Src homology gene of PVM was significantly lower in both neonates and weanling mice that had been pre-exposed to LPS (Fig. 1D). The viral load in the airway epithelium (Fig. 1E) and the parenchyma (data not shown) was significantly lower in the LPS-treated neonatal mice as compared with LPS-treated weanlings, or control vehicle-exposed mice of either age. The lower viral burden in mice treated with LPS as neonates was associated with significantly increased expression of Th1-associated genes, including IFN-γ, CXCL10, and CCL3 (Fig. 1F). Consistent with the elevated CXCL10 and CCL3 expression, neutrophilic inflammation was greater in the lungs of LPS-treated neonates as compared with weanlings (Fig. 1G). Innate type I IFNs, IFN-α4, and IFN-β were unaltered. Intriguingly, airway epithelial sloughing was significantly diminished in LPS-treated mice as compared with vehicle controls (Fig. 1H). Employing the acute LPS model as opposed to a multiple exposure model allowed us to map the temporal gene expression of lymphoid tissue-organizing cytokines (LT-α, TNF, IL-6), homeostatic chemokines (CXCL13, CCL19, CCL21), Th17-polarizing (IL-6, TGF-β, IL-1β, IL-23p19), and effector cytokines (IL-17A, IL-21, IL-22), all previously associated with lymphoid neogenesis and lymphocyte migration (10, 12). For all genes, with the exception of CCL21 and TGF-β, mRNA levels peaked at 6 h post-LPS exposure, and returned to baseline levels within 7 d (Supplemental Fig. 2). Of note, CCL19, CCL21, and IL-17A remained elevated at 28 dpi, possibly reflecting a contributory role in iBALT maintenance. Because iBALT formation occurred in an age-dependent manner, we next compared the induction of gene transcripts between neonatal and weanling mice. We found that LT-α, IL-6, CCL21, IL-1β, IL-21, IL-17A, IL-23p19, and CXCL13 mRNA were significantly greater in neonatal as compared with weanling mice (data not shown). In contrast, TGF-β, TNF-α, and IL-10 (data not shown) expression was significantly lower in neonatal mice. These findings were confirmed at the protein level in whole lung homogenates; the concentration of IL-6, IL-17A, IL-21, IL-22, but not IL-1β was significantly greater (Fig. 2A), whereas TNF production was significantly lower in neonatal as compared with weanling mice (Fig. 2A). Neonatal mice develop a pro–IL-17–associated cytokine microenevironment and diminished Treg recruitment compared with weanling mice. Wild-type BALB/c neonates and weanlings were exposed to vehicle or LPS (10 μg/g). (A) The concentration of IL-6, IL-1β, IL-17A, IL-21, IL-22, and TNF in lung homogenates at 3 d postexposure was measured by ELISA. Absolute numbers of pulmonary Tregs (B) and MLN Tregs (C) at 3 d postexposure, as measured by flow cytometry. Tregs were defined as CD4+ CD25+ Foxp3+ cells. Data are shown as mean ± SEM and are representative of >2 independent experiments (n = 5–6 mice per group). *p < 0.05, **p < 0.01, ***p < 0.001 analyzed by two-way ANOVA with Bonferroni posttest. IL-6, IL-1β, and IL-23 are instructive cytokines for the development of Th17-type cytokine-producing cells, and can also modulate the suppressor activity of Treg cells either directly or indirectly (17), whereas TNF and TGF-β can increase the suppressive ability of Treg cells (26). Because Treg cell migration to the MLN has been reported to affect iBALT formation (15), we next examined the numbers of Treg cells in the lungs and MLN of neonatal and weanling mice at baseline and in response to LPS. LPS exposure significantly increased the numbers of Treg cells in both the lung and MLN in weanling, but not neonatal mice (Fig. 2B, 2C). Of note, the increase in Treg cell numbers in the MLN (but not the lung) of weanling mice was significantly greater than that observed in the neonatal mice (Fig. 2C). To determine whether Treg cells suppressed the formation of iBALT in weanling mice, Treg cells were depleted by administering anti-CD25 mAb (PC61; Fig. 3A). Depletion of Treg cells led to a 3- to 4-fold increase in the percentage of weanling mice presenting with an iBALT (Fig. 3B), and a similar increase in the number of iBALT/level (Fig. 3C). Additionally, we employed FoxP3DTR mice, which allow for the selective and conditional depletion of Treg cells through administration of diphtheria toxin (21) (Supplemental Fig. 3A). Again, Treg cell depletion (Supplemental Fig. 3B) led to an increase in the percentage of weanling mice presenting with an iBALT (Supplemental Fig. 3C) and the number of iBALT/level (Fig. 3D). Anti-CD25–mediated Treg cell depletion significantly increased the expression of many of the BALT-associated genes found to be differentially expressed between neonates and weanlings, including IL-6, CXCL13, CCL19, CCL21, IL-17A, and IL-21 (Fig. 3E). Consistent with the elevated IL-17A gene expression, Treg cell depletion significantly increased IL-17A protein expression in the lung homogenates at both 6 and 72 h post-LPS instillation (Fig. 3F). Treg depletion in weanling mice promotes iBALT formation. (A) Study design of Treg depletion in wild-type BALB/c weanlings. (B) Effect of PC61 or IgG1 control on the frequency of mice that developed iBALT and (C) the number of iBALT per level (at 12 levels) at 28 d post-LPS exposure. (D) FoxP3-DTR transgenic mice and transgene-negative controls were treated with diphtheria toxin, and then exposed to LPS, as indicated in Materials and Methods, and the number of iBALT per level was quantified through 12 levels. (E) Weanling mice were treated with PC61 Ab or IgG1 control at days 26, 27, and 28 of life, treated with LPS (10 μg/g) at day 28 of life, and killed 6 h later. mRNA expression in the lungs was determined by quantitative PCR and expressed relative to the IgG1 control group. (F) IL-17A concentration in lung homogenates and (G) number of neutrophils in the lungs of PC61 and IgG1-treated mice. (H) Number of neutrophils in the lungs of FoxP3-DTR Tg+ and Tg− mice. (I) mRNA expression for neutrophil-active chemokines was measured, as described in (E). (J) Lung sections were probed with anti-CXCL9, and the percentage of immunoreactive AECs was quantified. Data are the mean ± SEM of one representative experiment (n = 5–6 mice per group). All experiments were performed two or three times. *p < 0.05, **p < 0.01, ***p < 0.001 analyzed by two-way ANOVA with Bonferroni posttest or Student t test, as appropriate. A key effector function of IL-17 is to promote neutrophil mobilization and recruitment by stimulating granulopoiesis and increasing chemokine expression at the site of inflammation/infection. Anti-CD25 treatment significantly increased lung neutrophilia at both 6 and 72 h in response to LPS instillation (Fig. 3G). Lung neutrophilia was similarly induced in diphtheria toxin–treated FoxP3DTR mice following LPS exposure (Fig. 3H). The neutrophilic response was associated with elevated CCL2, CCL5, and CXCL9 gene expression (Fig. 3I). Because CXCL9 is an IL-17 target gene (27, 28), induces the recruitment of neutrophils via CXCR3 (29, 30), and is produced at iBALT sites (31), we next probed the lung sections with anti-CXCL9. AECs were found to be the predominant source of CXCL9, with expression significantly increased at 72 h following Treg cell depletion (Fig. 3J). In view of the predisposition of neonatal mice to develop LPS-induced iBALT, we next assessed whether the magnitude of neutrophilic inflammation was similarly age dependent. Indeed, the number of tissue neutrophils (Fig. 4A), together with the gene expression of CCL2, CCL5, and CXCL9, was significantly greater in neonatal as compared with weanling mice (Fig. 4B). Furthermore, the percentage of CXCL9 AECs was significantly greater in LPS-exposed neonatal as compared with weanling mice (Fig. 4C). LPS-induced neutrophilia is greater in neonatal than weanling mice. (A) Number of Ly6G+ neutrophils in lung sections from LPS-exposed wild-type BALB/c neonates and weanlings. (B) mRNA expression in the lungs of wild-type BALB/c neonates and weanlings 6 h post-LPS exposure was determined by quantitative PCR. The expression of each gene in age-matched vehicle controls was normalized to 1. (C) Lung sections from LPS-exposed neonatal and weanling mice were probed with anti-CXCL9, and the percentage of immunoreactive AECs was quantified. Data are the mean ± SEM of one representative experiment (n = 5–6 mice per group) performed twice. *p < 0.05, **p < 0.01, ***p < 0.001 analyzed by two-way ANOVA with Bonferroni posttest or Student t test, as appropriate. Unlike BALB/c mice (employed in this study), iBALT formation in C57BL/6 mice requires repeated administrations of LPS (12). We confirmed this by inoculating both BALB/c and C57BL/6 mice acute LPS at day 0, and determining iBALT formation at 28 or 56 dpi (Fig. 5A, 5B). In contrast to the elevated neutrophilia and CXCL9 expression observed in BALB/c mice, neither response was evident in LPS-exposed C56BL/6 mice (Fig. 5C, 5D). Thus, the increased propensity for neonatal BALB/c mice to form iBALT as compared with weanling BALB/c mice or neonatal C57BL/6 mice was associated with neutrophil recruitment. LPS-induced neutrophilia is greater in BALB/c than C57BL/6 neonates. (A) Frequency of wild-type BALB/c or C57BL/6 mice that developed iBALT and (B) the number of iBALT per level (at 4 levels) at 56 d post-LPS exposure. (C) Number of Ly6G+ neutrophils in lung sections from LPS-exposed BALB/c or C57BL/6 mice. (D) Lung sections were probed with anti-CXCL9, and the percentage of immunoreactive AECs was quantified. Data are mean ± SEM (n = 6–8 mice per group) of one representative experiment, performed >2 times, except (A), which represents multiple independent experiments. *p < 0.05, **p < 0.01, ***p < 0.001 analyzed by two-way ANOVA with Bonferroni posttest or Student t test, as appropriate. We next determined whether neutrophil depletion would attenuate LPS-induced iBALT formation. 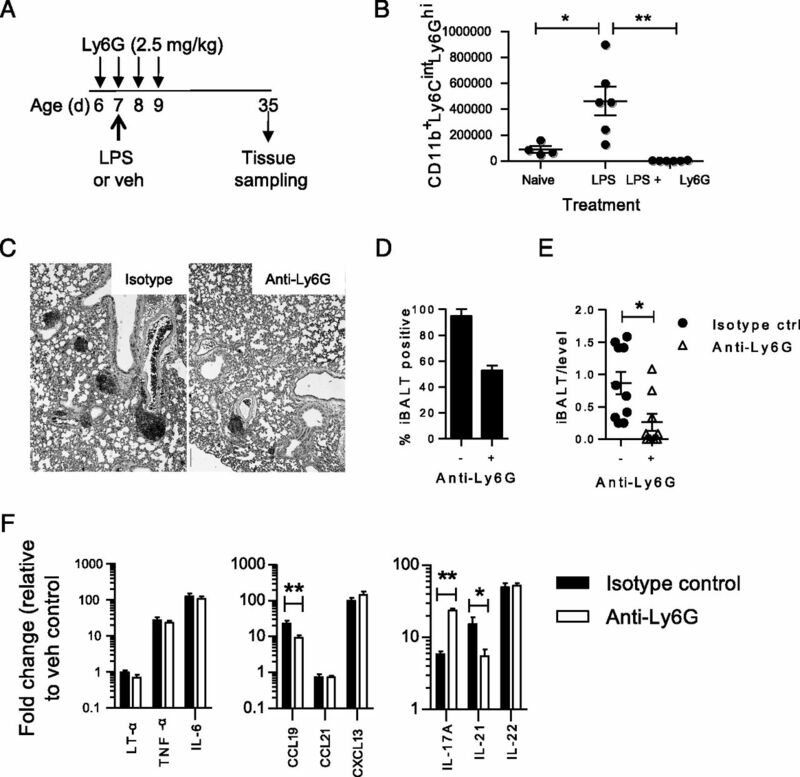 Neonatal mice were treated with anti-Ly6G (Fig. 6A), to selectively deplete neutrophils (32), which was confirmed by immunohistochemistry (data not shown) and flow cytometry (Fig. 6B). Importantly, anti-Ly6G did not affect the numbers of granulocytic or monocytic myeloid-derived suppressor cells (Supplemental Fig. 4). In two separate experiments, we demonstrated that anti-Ly6G treatment halved the percentage of mice that developed an iBALT (Fig. 6C, 6D), and significantly diminished the number of iBALT/mouse (Fig. 6E). We next determined whether neutrophil depletion affected the expression of key genes associated with iBALT formation. Surprisingly, one of the few genes to be elevated was IL-17A (Fig. 6F), suggesting that IL-17A most likely functions upstream of neutrophil infiltration. By contrast, CCL19 gene expression was significantly reduced, together with the expression of IL-21, which has been shown to have an autocrine role in Th17 generation. 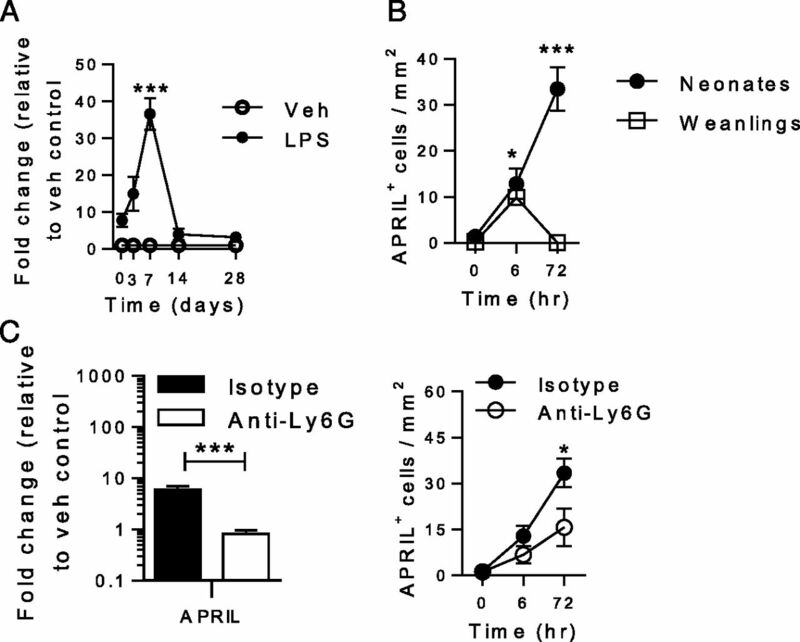 Neutrophil depletion attenuates LPS-induced iBALT formation. (A) Study design. (B) Effect of anti-Ly6G on lung neutrophils as measured by flow cytometry at 6 h post-LPS exposure. (C) Representative photomicrographs of lung sections containing iBALT from intact and neutrophil-depleted mice after LPS exposure. (D) Frequency of intact or neutrophil-depleted mice that developed iBALT and (E) the number of iBALT per level (at 12 levels) at 28 d post-LPS exposure. Lines represent the mean. (F) mRNA expression of cytokines and chemokines in the lungs of intact or neutrophil-depleted neonates 6 h postexposure was determined by quantitative PCR. Data are the mean ± SEM and are representative of two independent experiments (n = 5–6 mice per group). *p < 0.05, **p < 0.01 analyzed by one-way ANOVA with Bonferroni posttest or Student t test, as appropriate. T follicular helper cells are believed to be the predominant source of IL-21, although it is also produced by other cells, including neutrophils. Indeed, Puga et al. (33) recently demonstrated that neutrophils provide help to B cells in the form of IL-21 and APRIL. Intriguingly, we observed that, in neonatal mice, APRIL gene expression was upregulated at 6 h and peaked at 7 d post-LPS exposure (Fig. 7A). When we examined APRIL protein expression by immunohistochemsitry, we observed significantly more APRIL-positive cells in neonatal as compared with weanling mice (Fig. 7B). APRIL gene and protein expression was significantly decreased in neonatal mice in response to neutrophil depletion (anti-Ly6G treatment; Fig. 7C), consistent with decreased iBALT formation following this perturbation. To evaluate the contribution of IL-21, we treated neonatal mice with IL-21R Fc to antagonize the receptor (Fig. 8A) and observed a reduction in the percentage of mice with an iBALT, and a significant diminution in the number of iBALT per mouse (Fig. 8B, 8C). Although IL-21 can impair Treg cell homeostasis and function (20), IL-21R-Fc did not affect the numbers of Treg cells in either the lung or MLN at 3 d post-LPS inoculation (data not shown). APRIL expression is associated with iBALT formation. (A) mRNA expression of APRIL in the lungs of wild-type BALB/c neonates at various time points post-LPS exposure was determined by quantitative PCR. (B) Number of APRIL+ cells in lung sections from LPS-exposed neonates and weanlings. (C) Effect of neutrophil depletion on APRIL mRNA expression at 6 h post-LPS exposure and the number of APRIL+ cells infiltrating the lung at 6 and 72 h post-LPS exposure. Data are shown as the mean ± SEM and are representative of two or more independent experiments (n = 5–6 mice per group). *p < 0.05, ***p < 0.001 analyzed by two-way ANOVA with Bonferroni posttest or Student t test, as appropriate. IL-21, APRIL, and iBALT formation. (A) Study design. Wild-type BALB/c neonates were injected i.p. with a soluble IL-21R-Fc fusion protein (10 μg/treatment) or vehicle on days 6, 7, 8, 9, 11, 13, 15, 17, 19, and 21 of life. The mice were intranasally administered vehicle or LPS (10 μg/g) on day 7 of life, and sacrificed at 28 d postexposure. (B) Frequency of iBALT development in IL-21R-Fc– or vehicle-treated mice and (C) the number of iBALT per level (at 12 levels) 28 d post-LPS exposure. Data are the mean ± SEM and are representative of two independent experiments (n = 6–8 mice per group). ***p < 0.001 analyzed by Student t test. iBALT is an ectopic lymphoid organ that develops in the lung in response to infection or inflammation, and can be either beneficial or detrimental (3, 4, 7). Accordingly, a greater understanding of iBALT formation and maintenance is required to manipulate this enigmatic tissue. In this study, we have shown that the reduced capacity of weanling as compared with neonatal mice to develop iBALT (in response to LPS) can be reversed by the depletion of Treg cells. This was associated with increased expression of IL-17A, CXCL9, and the recruitment of neutrophils into the lungs. 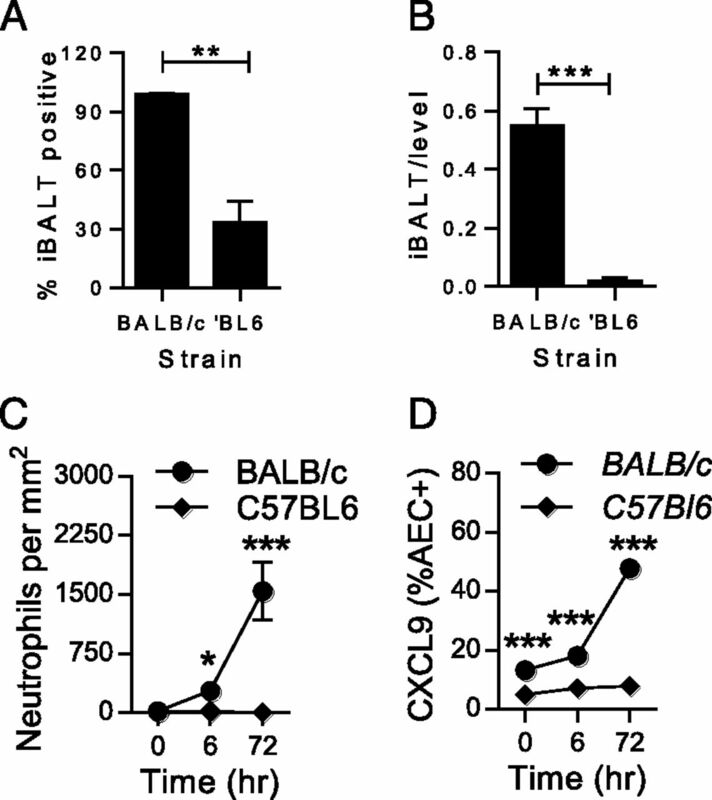 Moreover, the greater propensity for neonatal BALB/c mice to generate iBALT was associated with increased neutrophilic inflammation in the lungs, which, when ablated by Ab-mediated depletion, decreased the expression of the B cell active cytokines IL-21 and APRIL, and abrogated the formation of iBALT. To our knowledge, this is the first study to demonstrate that neutrophils contribute to the formation of a tertiary lymphoid organ (TLO). Consistent with the greater prevalence of iBALT in healthy children as compared with healthy adults (34, 35), we observed that iBALT form more readily in neonatal as compared with weanling BALB/c mice. Remarkably, in BALB/c mice, but not C57BL/6 mice, LPS exposure at day 0 alone was sufficient to induce iBALT development, contrasting with the requirement for repeated LPS exposure in C57BL/6 mice (12). Importantly, because iBALTs persisted for at least 8 wk, and the formation was age dependent, this allowed us to interrogate whether iBALT was beneficial against a respiratory pathogen in mice with a full complement of SLOs. Strikingly, LPS exposure in neonatal and weanling mice significantly diminished viral burden in response to acute Pneumovirus infection later in life, and decreased the magnitude of sloughing of the airway epithelium, consistent with a protective role for iBALT. Our findings are in agreement with previous reports demonstrating that BALT can confer protection against various respiratory viruses and limit immunopathology (3–5). Although the mechanistic basis for this phenomenon remains to be definitively elucidated, we observed that the increased presence of iBALT was associated with increased expression of the neutrophil chemokines CCL3 and CXCL10, a heightened neutrophilia, and elevated IFN-γ expression. This may relate to qualitative difference with regard to the better organization of iBALT when formed in early life (12), although we did not specifically explore this aspect of iBALT biology or the source of the immune factors, as our studies were focused on the processes that underlie iBALT formation. In an elegant study, Halle et al. (5) employed two-photon microscopy to demonstrate that Ag-pulsed dendritic cells migrate into preformed BALT and present Ag to T cells, highlighting iBALT as an inductive site for T cell priming. However, in our model, the preformed iBALT most likely enhanced the innate immune response because we did not observe PVM immunoreactivity in or around the iBALT areas, and the viral load was lower within 7 d of inoculation, prior to the peak of the adaptive response in this model (36). Collectively, our study and those of other investigators suggest that iBALT acts as a local site to facilitate the induction of innate and adaptive immunity. A previous study found that the failure of CCR7-deficient Treg cells to home to the MLN leads to spontaneous iBALT formation (15). In our study, LPS exposure induced an 8-fold increase in Treg cell numbers in the MLN of weanling mice, whereas, in neonatal mice, which developed iBALT, Treg cell numbers increased <2-fold. This may reflect an ontogenic effect or the reduced suppressor function of Treg cells in early life (37, 38). Remarkably, the conditional depletion of Treg cells with either anti-CD25 or via administration of diptheria toxin to FoxP3-DTR mice enabled weanling mice to develop iBALT to a similar degree as that observed in neonatal mice. Of note, depletion of Treg cells increased the expression of CXCL13 and CCL19, which contribute to iBALT formation and maintenance through the recruitment of B and T cells (39, 40). Randall and colleagues (12) reported that both of these chemokines can be induced in pulmonary fibroblasts by IL-17A, and that IL-17A production underlies the age dependency of LPS-induced iBALT formation in C57BL/6 mice (12). In our study (using BALB/c mice), we confirmed the age-dependent expression of IL-17A, which is most likely produced by γδ T cells given the immediacy of the response, and extended these findings by demonstrating that Treg cell depletion in weanling mice increased IL-17A expression to promote iBALT formation, highlighting the importance of the Treg cell to IL-17–producing cell ratio. IL-17A is known to promote neutrophilic inflammation by inducing the expression of neutrophil-active chemokines by local stromal cells. Using immunohistochemistry, we observed that CXCL9 was upregulated in the airway epithelium in response to LPS, consistent with the elevated CXCL9 expression in and around lymphoid follicles, including AECs of COPD patients (31). In addition to neutrophils, CXCR3 expression (the cognate receptor for CXCL9) is elevated on CD4+ Th1 cells, on CD8+ T cells, and on the B lymphocytes at the center of the follicles within iBALT (31, 41), further supporting an important role for this receptor–ligand interaction in iBALT formation and maintenance. Although the formation of lymph nodes is dependent on LTi cells, iBALT readily form in RORc−/− and Id2−/− mice, which lack this type 3 innate lymphoid cell subset (12). Although RORc−/− mice also lack Th17 cells, they are able to generate an extensive neutrophilia (caused by a lack of bacterial containment), and develop iBALT in response to influenza virus infection (13). Because we observed elevated IL-17A and CXCL9 production with a concomitant neutrophilic infiltrate in neonatal mice, we hypothesized that neutrophils, rather than LTi cells, were important for iBALT formation. Strikingly, we found that Ab-mediated depletion of neutrophils markedly diminished iBALT formation. To our knowledge, this is the first study to describe a role for neutrophils in lymphoid neogenesis. This is somewhat surprising as neutrophils are one of the first inflammatory cells to be recruited to the site of sterile or infectious inflammation, can migrate from the inflammatory site to the draining lymph nodes, and are increasingly recognized as modulators of adaptive immunity (42–44). Indeed, neutrophils have been observed to infiltrate the iBALT area (12, 45) as well as other TLOs (46, 47), and are recruited in response to other TLR ligands or infectious pathogens shown to initiate iBALT formation in various animal species (4, 48). Perhaps most significantly, neutrophilic inflammation is a common feature of diseases in which iBALTs are prevalent, including COPD, rheumatoid arthritis, asthma, idiopathic pulmonary fibrosis, tuberculosis, and hypersensitivity pneumonitis. Whether neutrophils contribute to the inception and maintenance of iBALT in these diseases will be an important area of research, especially if iBALT contribute to pathogenesis by providing a niche for autoreactive T and B cells, as has recently been described in experimental models of COPD and multiple sclerosis (49, 50). Our findings suggested that Treg cells may attenuate iBALT formation in part by suppressing neutrophilia in the lung. Others have shown that Treg cells can dampen neutrophilia by altering local chemokine gradients, promoting neutrophil apoptosis, or limiting Th17 responses. The mechanism by which Treg cells control neutrophils in the setting of iBALT development remains unclear; however, our data and that of Kocks et al. (15) suggest that Treg cells mediate their effects in the MLN. Given that neutrophils are now appreciated to be among the first phagocytes to circulate from tissue sites to SLO (42, 43), we speculate that Treg cells exert their anti-BALT–forming activity in this compartment. Potentially neutrophils may be able to counter-regulate this suppression through the production of cytokines such as IL-21. Although we did not see an effect of IL-21 blockade on Treg cell numbers, it is possible that neutrophil-derived IL-21 increased iBALT formation by decreasing Treg cell suppressor function in the MLN. Indeed, the molecular pathway by which neutrophils promote the neogenesis of iBALT remains to be fully elucidated; however, their ability to secrete APRIL, BAFF, and IL-21 suggests that neutrophils are able to affect B cell function and survival (33, 51). Intriguingly, it has been reported that specialized subsets of neutrophils exist, with the type 2 B cell-helper neutrophil population more able to produce APRIL, BAFF, IL-21, and IL-6 (33). Of note, APRIL promotes B cell class switching to IgA (52), which is increased in the presence of iBALT (40, 49), and is known to contribute to protective immunity. In human MALT, APRIL-secreting neutrophils can promote the survival of plasma cells (53), whereas antagonism of APRIL in human synovial tissue reduces the size of germinal centers and decreases the follicular dendritic cell network (49). In our study, APRIL expression was greater in neonatal than weanling mice, and reduced in neonates following neutrophil depletion. Of note, many of the cells that were immunoreactive for APRIL at day 3 had a polymorphonuclear phenotype, consistent with that of neutrophils. LPS exposure led to the rapid induction of APRIL gene expression, although peak expression occurred at day 7 when neutrophilic inflammation had resolved. Thus, neutrophils are most likely just one in a series of cellular and molecular events that are necessary to coordinate the formation of iBALT in response to LPS. However, it is also important to note that, unlike most TNF family members, APRIL is secreted as a soluble ligand and can bind heparan sulfate proteoglycans. This supports the retention of APRIL at the site of inflammation, increases its efficacy via multimerization (54), and may provide a niche for TLO formation (53). It is also conceivable that, during a disease exacerbation, the acute-on-chronic inflammation sustains and/or enlarges preformed iBALT, facilitating the expansion of autoreactive lymphocytes and potentially aggravating pathology. Thus, it will be important to elucidate whether neutrophils establish such niches in the many varied chronic inflammatory pathologies in which iBALT are prevalent, and whether the antagonism of APRIL or other neutrophil-derived mediators will promote the resolution of iBALT. We thank Matthew Rogers, Parisa Mohammadzadegan, and the animal staff at University of Queensland for contributions. This work was supported by National Health and Medical Research Council of Australia Project Grant 631020 and an Association pour la Recherche sur le Cancer Future Fellowship (to S.P.).
. 2006. Inducible bronchus-associated lymphoid tissue (iBALT) in patients with pulmonary complications of rheumatoid arthritis. J. Clin. Invest. 116: 3183–3194.
. 1996. Germinal center formation and local immunoglobulin E (IgE) production in the lung after an airway antigenic challenge. J. Exp. Med. 184: 2353–2360. Moyron-Quiroz, J. E., J. Rangel-Moreno, K. Kusser, L. Hartson, F. Sprague, S. Goodrich, D. L. Woodland, F. E. Lund, and T. D. Randall. 2004. Role of inducible bronchus associated lymphoid tissue (iBALT) in respiratory immunity. Nat. Med. 10: 927–934.
. 2009. Inducible bronchus-associated lymphoid tissue elicited by a protein cage nanoparticle enhances protection in mice against diverse respiratory viruses. PLoS One 4: e7142. Available at: http://journals.plos.org/plosone/article?id=10.1371/journal.pone.0007142.
. 2009. Induced bronchus-associated lymphoid tissue serves as a general priming site for T cells and is maintained by dendritic cells. J. Exp. Med. 206: 2593–2601.
. 2004. Lung immunity: necessity is the mother of induction. Nat. Med. 10: 904–905.
. 2010. Regulation of inducible BALT formation and contribution to immunity and pathology. Mucosal Immunol. 3: 537–544.
. 1973. The postnatal development of lymphoreticular aggregates and lymph nodes in infants’ lungs. J. Clin. Pathol. 26: 539–545.
. 1995. Bronchus-associated lymphoid tissue (BALT) in the lungs of children who had died from sudden infant death syndrome and other causes. Thorax 50: 658–660. 2003. Organogenesis of lymphoid tissues. Nat. Rev. Immunol. 3: 292–303.
. 2010. Lineage relationship analysis of RORgammat+ innate lymphoid cells. Science 330: 665–669.
. 2011. The development of inducible bronchus-associated lymphoid tissue depends on IL-17. Nat. Immunol. 12: 639–646.
. 2011. Microbiota-induced tertiary lymphoid tissues aggravate inflammatory disease in the absence of RORgamma t and LTi cells. J. Exp. Med. 208: 125–134.
. 2011. Th17 cells induce ectopic lymphoid follicles in central nervous system tissue inflammation. Immunity 35: 986–996.
. 2007. Regulatory T cells interfere with the development of bronchus-associated lymphoid tissue. J. Exp. Med. 204: 723–734.
. 2003. Interleukin-23 promotes a distinct CD4 T cell activation state characterized by the production of interleukin-17. J. Biol. Chem. 278: 1910–1914.
. 2006. IL-1 beta breaks tolerance through expansion of CD25+ effector T cells. J. Immunol. 176: 7278–7287.
. 2003. Toll pathway-dependent blockade of CD4+CD25+ T cell-mediated suppression by dendritic cells. Science 299: 1033–1036. Attridge, K., C. J. Wang, L. Wardzinski, R. Kenefeck, J. L. Chamberlain, C. Manzotti, M. Kopf, and L. S. Walker. 2012. IL-21 inhibits T cell IL-2 production and impairs Treg homeostasis. Blood 119: 4656-4664. doi: 4610.1182/blood-2011-4610-388546.
. 2011. Plasmacytoid dendritic cells promote host defense against acute pneumovirus infection via the TLR7-MyD88-dependent signaling pathway. J. Immunol. 186: 5938–5948.
. 2011. Interleukin-21 is critically required in autoimmune and allogeneic responses to islet tissue in murine models. Diabetes 60: 867–875.
. 2002-2003. Stimulation of bronchus-associated lymphoid tissue in rats by repeated inhalation of aerosolized lipopeptide MALP-2. Pathobiology 70: 266–269.
. 2000. Antigen uptake and subsequent cell kinetics in bronchus-associated lymphoid tissue. Respirology 5: 141–145.
. 2007. Interaction of TNF with TNF receptor type 2 promotes expansion and function of mouse CD4+CD25+ T regulatory cells. J. Immunol. 179: 154–161.
. 2008. Infiltrated neutrophils acquire novel chemokine receptor expression and chemokine responsiveness in chronic inflammatory lung diseases. J. Immunol. 181: 8053–8067.
. 2003. Early granuloma formation after aerosol Mycobacterium tuberculosis infection is regulated by neutrophils via CXCR3-signaling chemokines. Eur. J. Immunol. 33: 2676–2686.
. 2009. Lymphoid follicle cells in chronic obstructive pulmonary disease overexpress the chemokine receptor CXCR3. Am. J. Respir. Crit. Care Med. 179: 799–805.
. 2012. B cell-helper neutrophils stimulate the diversification and production of immunoglobulin in the marginal zone of the spleen. Nat. Immunol. 13: 170–180.
. 2000. Bronchus-associated lymphoid tissue (BALT) is not present in the normal adult lung but in different diseases. Pathobiology 68: 1–8.
. 1998. Lymphoid aggregates in endobronchial biopsies from young elite cross-country skiers. Am. J. Respir. Crit. Care Med. 158: 597–601. Kaiko, G. E., Z. Loh, K. Spann, J. P. Lynch, A. Lalwani, Z. Zheng, S. Davidson, S. Uematsu, S. Akira, J. Hayball, et al. 2013. Toll-like receptor 7 gene deficiency and early-life Pneumovirus infection interact to predispose toward the development of asthma-like pathology in mice. J. Allergy Clin. Immunol. 131: 1331-1339.e10.
. 2005. Developmental regulation of Foxp3 expression during ontogeny. J. Exp. Med. 202: 901–906.
. 2011. Induction of colonic regulatory T cells by indigenous Clostridium species. Science 331: 337–341.
. 2007. Pulmonary expression of CXC chemokine ligand 13, CC chemokine ligand 19, and CC chemokine ligand 21 is essential for local immunity to influenza. Proc. Natl. Acad. Sci. USA 104: 10577–10582.
. 2009. Dendritic cells are crucial for maintenance of tertiary lymphoid structures in the lung of influenza virus-infected mice. J. Exp. Med. 206: 2339–2349. Grumelli, S., D. B. Corry, L.-Z. Song, L. Song, L. Green, J. Huh, J. Hacken, R. Espada, R. Bag, D. E. Lewis, and F. Kheradmand. 2004. An immune basis for lung parenchymal destruction in chronic obstructive pulmonary disease and emphysema. PLoS Med. 1: e8. Available at: http://journals.plos.org/plosmedicine/article?id=10.1371/journal.pmed.0010008.
. 2010. Neutrophils influence the level of antigen presentation during the immune response to protein antigens in adjuvants. J. Immunol. 185: 2927–2934.
. 2011. Neutrophils in the activation and regulation of innate and adaptive immunity. Nat. Rev. Immunol. 11: 519–531.
. 2005. Neutrophils mediate immune modulation of dendritic cells through glycosylation-dependent interactions between Mac-1 and DC-SIGN. J. Exp. Med. 201: 1281–1292.
. 2006. BALT development and augmentation of hyperoxic lung injury in mice deficient in NQO1 and NQO2. Free Radic. Biol. Med. 40: 1843–1856.
. 2003. Helicobacter-induced chronic active lymphoid aggregates have characteristics of tertiary lymphoid tissue. Infect. Immun. 71: 3572–3577.
. 2008. Lymphoid neogenesis and immune infiltration in aged liver. Hepatology 47: 1680–1690.
. 2009. TLR2/6 stimulation of the rat lung: effects on lymphocyte subsets, natural killer cells and dendritic cells in different parts of the air-conducting compartments and at different ages. Immunology 126: 132–139.
. 2013. Role of CXCL13 in cigarette smoke-induced lymphoid follicle formation and chronic obstructive pulmonary disease. Am. J. Respir. Crit. Care Med. 188: 343–355.
. 2012. T cells become licensed in the lung to enter the central nervous system. Nature 488: 675–679.
. 2007. Neutrophil-derived APRIL concentrated in tumor lesions by proteoglycans correlates with human B-cell lymphoma aggressiveness. Blood 109: 331–338.
. 2008. Thymus-independent class switch recombination is affected by APRIL. Immunol. Cell Biol. 86: 530–534.
. 2008. APRIL secreted by neutrophils binds to heparan sulfate proteoglycans to create plasma cell niches in human mucosa. J. Clin. Invest. 118: 2887–2895.
. 2009. The proteoglycan (heparan sulfate proteoglycan) binding domain of APRIL serves as a platform for ligand multimerization and cross-linking. FASEB J. 23: 1584–1595.